The planet as we know has been made possible through the action of tiny solar factories located inside plant cells. It may sound farfetched, but the success of our farming enterprises depends on how effectively our plants photosynthesise. The aim of any good biological farmer is to maximise a plants potential to photosynthesise. 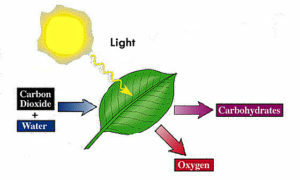 Photosynthesis is the process of converting light energy to chemical energy and storing it in the bonds of sugar. This sugar becomes building blocks which then form fats, proteins, starch, cellulose etc – what leaves the farm gate and what drives the profitability of your operation! The faster the solar factory functions, more sugars are produced, and more sugar (CHO – Carbon, Hydrogen and Oxygen) is then released into the soil to feed the microbes. In turn the microbes build humus, stable carbon, fix nitrogen, provide minerals to the plants and help with plant defence; ergo, sugar production is good. How can we measure photosynthesis? Refractometers provide a very simple but indispensible tool to gauge photosynthesis, which is measured as degrees of Brixo. 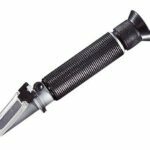 The refractometer is a tool which any farmer or grower can use to help predict crop quality, yield, weeds/pest/disease/stress or frost resistance (*). When just a few drops of sap or juice are placed on the refractometers prism and held up to the light, the light passing through the sap is refracted (bent) according to the composition of that sap. The Brix measurement can be read off the scale, showing levels of sugar, minerals, proteins and vitamins in the plant’s juices, commonly referred to as dissolved solids. Higher Brix levels (generally over 12), indicate higher nutritional and medicinal values, and lower nitrate and water levels. Measuring the brix of a fruit or vegetables can indicate the taste and potential shelf life of the produce after harvest. Brix readings can help determine the suitability of a fertiliser mix. Measure Brix on the crop and a control before application, then re-test 1-24 hours after input. Brix needs to lift by at least 1 point above the control. If it remains the same or drops, then this input can be considered not suitable at this time. Measuring the brix of a plant’s sap gives an immediate overview of the general health of a crop at any stage of production. Start testing the brix of all your food, including milk. Try comparing purchased fruit and vegetables to the food in your garden. Studies show mineral values in food have fallen by 30-60% since 1940 -This just may be the best tool to get your home garden pumping! Take at the same time of the day (allowing for at least two hours of sunshine in the morning). Take a sample from the same part of the plant (then ensure all subsequent readings follow suit). (*) Brix levels can vary due to stress and/or dehydration. This is why it is vital to keep good records and monitor changes in brix and to avoid sampling insect or disease damaged leaves. Step 1: Open the daylight plate ( 1), Clean the refraction prism (2) carefully with soft flannelette. Be careful not to scrape the prism surface. Step 2: Choosing the first fully developed leaves, rolling them into a small ball, placing that ball in the well of a good quality garlic crusher and then squeezing out the sap. Step 3: Put some 2-3 drops of sap on the prism surface and then cover the daylight plate slowly to let the solution slowly cover the prism surface reducing any air bubbles. Step 4: Turn the refractometer towards a light source or bright place. Turn the focus adjustment (7) until the graduated lines can be seen clearly. The readings of the demarcation line between brightness and darkness indicate the dissolved solids. The blurrier the line, the better. if the line is sharp between bright and dark, this can indicate free nitrogen and lower food quality. Relying on published brix readings as guidelines can be problematic as often it is not stated whether the readings are derived from the plant sap or fruit juice. The method of extracting sap can have a large influence on the reading. -This is why it is important you always use the same methods. Generally, brix readings will drop with low atmospheric pressure (eg. the onset of a storm). Measure your weeds! Your weeds should have a lower Brix level, if not you need to look at why your current programme is favouring weed production. If the brix is higher in your weeds than your crop you may need to intervene to reduce the threat of yield reductions. If the Brix is lower in the weeds, you can afford to leave them as the crop will out compete them in time. Brix is lowest at dawn, highest after midday, and is affected by in-coming storms and cloud cover. 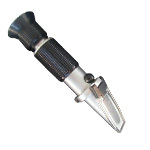 To prevent brix dropping quickly, use a foliar spray of fulvic acid. The lower the humus levels, the faster the brix will drop following prolonged cloudy or rainy periods. Brix lower in the morning than afternoon, suspect Boron if not, as this trace mineral is responsible for translocating sugars into the roots. Brix needs to be read with other tools and good observations. Take good records, during one single day, and across the season to get a true picture of your crops.